Creating a big, bright and airy home has never been more popular amongst homeowners. It’s fast becoming a main reason why many are choosing to make improvements to their home. If you are extending a property, opting for lots of glass allows you to take full advantage of all the benefits that natural light can bring to a home. Here at Frame Fast in Derby, we’ve found it’s all about adding more glass and reducing the size of the frame to bring as much light into a space as possible, whether that’s through windows, the door or roof. To create the ultimate bright and open space, a popular choice is to team our innovative Skypod skylight with sleek aluminium bifold doors to bring lots of daylight inside, from all directions. 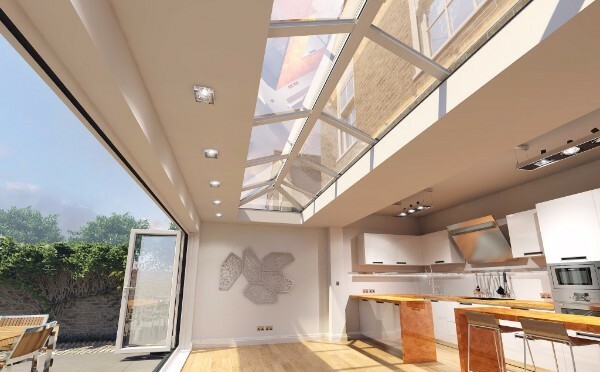 Whether it’s for a kitchen and living room extension, or even as part of an orangery, Skypod skylights and bifold doors are ideal for homeowners wanting to soak up as much light as possible. When building an extension, there are plenty of opportunities to win more business by adding Skypod skylights and bifold doors to your product range. Not only do Skypod skylights and bifold doors add light, they also look really impressive too, with slim frames, stylish designs and a wide choice of colour options. We make it so much easier to order Skypod skylights and bifold doors. You can measure at the same time, place your order together and have your glazing delivered ready to fit in just 2 weeks. To create a stunning feature in an extension, a Skypod skylight is ideal. With a pitched design, our Skypod skylights are designed to let in the maximum amount of light, to flood an extension with natural sunlight all day. Manufactured in a choice of two-bar or three-bar designs, with sizes as large as 2750mm x 8700mm, Skypod skylights are designed to make extensions feel much bigger, adding both height and depth to your project. Skypod skylights are designed with fewer components, making it much easier and quicker to install, so that you can keep to schedule, and complete the job fast. If you’re on a tighter schedule, we have five of our most popular colour options available for delivery in just 2 weeks, so you can get the job done as quick as possible. For a more individual option, your customer can choose from any RAL colour for their made-to-order Skypod skylight. The beauty of introducing aluminium bifold doors to a new extension, is that they seamlessly open up a home to the outside. With impressive spans of glass that help to fill the inside of a property with light, they also are designed to fold away to the side, creating a wide and open space that connects a home to its garden. Designed with modern slimline frames which help to maximise the amount of glass, door panels are available up to 1200mm wide by 2500mm tall, suiting any project, big or small. We understand that your project needs to stay on time, that’s why you can choose stock aluminium bifold doors in anthracite grey or white, with fast lead times of only two weeks! So, your bifold doors can be delivered, along with your Skypod skylight, ready to install, super-fast. If it’s a more bespoke colour you’re after, any RAL colour or dual colour is available, made to order with delivery in as little as 6 weeks. Here at Frame Fast, we manufacture Skypod skylights and aluminium bifold doors in our Derby factory, so you can get your glazing products at a time to suit your schedule. If you would like to find out more about all the benefits of Skypod skylights and aluminium bifold doors, or to place an order, you can call our experts on 01332 344459 or drop by our Trade Counter on Ascot Drive.